People, gather round, because tomorrow we vote for the next government from Westminster. To my shame, these blogs have ignored one element of society that is blessed with the many columns of the 5th estate and claims to have given us much in the last 5 years, even though we elected only one of their number in 2010. How generous they are. So, What have the Tories done for us? They introduced the Welfare Reform Act, with the Bedroom Tax, and Universal Credit, they have a private company incentivised to take away disabled allowances and generally slashed spending with no support and have left the most vulnerable in our society high and dry. Ok, so apart from the Bedroom tax, Universal credit and stuffing disabled people, what have the Tories ever done for us? They have made education more expensive – students in England and Wales leave uni more than £44k in debt, which is crazy. In Scotland, the costs to protect students from Tuition fees rise, but that has been delivered and held by the SNP. Labour and Lib Dems welshed on this when they ran Holyrood, but then the Lib Dems did a stunning backflip to get into WM government and ditched promises to stop tuition fees. Nick Clegg is sorry. Right . . . So apart from Welfare Reform and Tuition Fees, what have the Tories ever done for us? They’ve trashed the NHS good and proper. In their last election campaign, Tories promised “no more top-down reorganisations” of the NHS, which was reiterated in the coalition agreement with the Libe Dems (yes, them again). What has followed is the largest, most damaging top down reorganisation of the NHS in England ever seen. And all the savings from the NHS mean less money is allocated to the NHS for Scotland, which the SNP have tried to keep on track with absolutely limited privatisation. In the referendum campaign, Labour told us in Scotland the NHS was fine in the UK. But we know the standards of care creeping in south of the border are falling behind what we want to see in Scotland. Kailash Chand of the BMA said “Government Policy and privatisation mean the NHS as we know it could be gone in as little as five years”. Interesting how many Tory, and even Labour MPs have directorships in private health providers! Indeed! Well OK, but apart from a crumbling NHS, Education to all who can afford it and the ‘you’ll no be well fare act’, what have the Tories ever done for us? Well, the Tories are to the Environmnet what Ghengis Khan was to peaceful negotiation! When Cameron said his government would be the greenest ever, he was talking about envy or something, but not the environment. The Coalition (yes, you too Nick Clegg) have enthusiastically encouraged Frackers, even to the extend of changing Tresspass law to allow fracking beneath homes south of the border without homeowners permission. Talk about an enabling act! Jeez, so the Tories have fracked off the environment, but surely the economy is sound though? Well, the bankers are happy. But priority número uno was to eliminate the UK deficit by 2016-17. They are miles off! They say there are some more Jobs, but how many of those are zero hours contracts? In the EU, the UK has the second largest deficit (commiserations to Croatia). Deficit. That’s not good. 2014-15 deficit at £87bn. Over twice what Osborne predicted it would be this year. On a positive note, the Tories and Liberals cut tax on the highest earners. Hmmm. Right so apart from failing on economic targets, letting the environment go to Frack, privatising the NHS, penalising the poor for, well, for being poor and breaking promises on education, are there any redeeming features of the Tories? Absolutely. Just one. They’ll be horsed out of government if anyone has been paying attention. Genuine progressive parties on the rise, we could even see a higher quality of politics seeping into Westminster, where principle and policy trumps profit and spin. And as for the Lib Dems, who misjudged their own members and supporters and chose to help the Tories, I hope their judgement will be swift and conclusive. Don’t darken our door again! The latest general election drama wizard story (The Times, 4th May 2015) is that Labour suits may undermine formation of a Labour minority government with anti-Tory support, if Miliband is as much as 12 seats behind Cameron. Oblivious to, or perhaps because of, potentially 40 – 50 SNP seats in WM. So Miliband could be stabbed in the back, and sacked, by his own MPs while the country is clamouring for a government free of the Tories. This beggars belief (but perhaps not if you can recall the machinations of Labour MPs in 1979′ before and after the Referendum of that year)! If any of this is to be spun by Scottish Labour to pressure folk to give them another chance, I think this is doomed. It is a poor tactic to win back Scotland, at this election or any other, because this belies the Labour narrative that SNP support this year is just a protest vote, some kind of weird post-indyRef reaction. But here is the news. Labour voters in their once-heartland are not voting SNP to keep Labour (the Red Tories) in check, but rather because they can’t stomach voting Labour any longer. Murphy is unappealing and not particularly trusted (careful wording here). Miliband has had a better campaign than expected, but Nicola Sturgeon has excelled, talking the language once-Labour voters want to hear. And, most importantly, she is talking their language because that is what she believes, and you just can’t fake that, Jim. 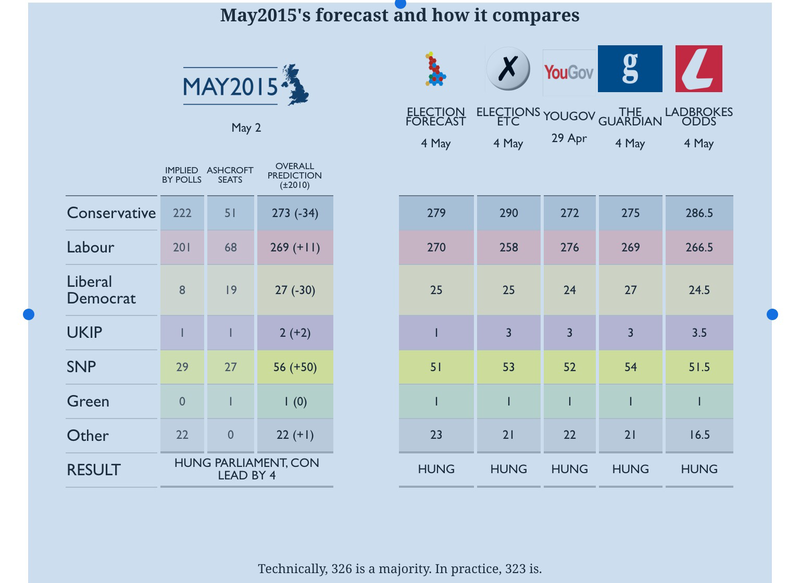 Finally, the graphic below, (from New Statesman, online) with all the seat predictions is telling. Labour are behind the Tories in all but one prediction. Ranging from only 4 seats, to over 30 seats. But in each prediction, the SNP seats are consistently within 2 or 3 seats of the mean. So the difference for Labour is not Scottish seats, but how Labour performs in England. If Labour want to govern the UK, they need to do better in England. The pain felt by the remainder of Scottish Labour is because Labour are now reaping the rewards of taking Scottish votes for granted. For too long, Labour has lazily used the block Scottish vote as a makeweight against their deficit in England. Perhaps if Kinnock, Blair and Brown had steered closer to those ‘Traditional Labour Values’ in England, they may now be feeling some of the admiration Nicola Sturgeon is attracting both sides of the border. Liberal Democrat leader, Nick Clegg, has built himself a box this weekend and jumped right into it. In an interview with the Financial Times on Saturday, he clearly declared that he’ll have no truck with a government that relies upon the support of either UKIP or the SNP. But his bluster fails the Westminster arithmetic test. While the few UKIP MPs anticipated will be insignificant to a Tory-Liberal minority coalition, ruling a 50-strong SNP contingent out of any Lib-Lab pact could sink the anti-Tory consensus which the majority of the population support. Thus demonstrating the Liberal Democrats are not particularly Liberal and most certainly undemocratic. Clegg’s campaign has been designed to return him as Deputy PM, regardless of the suitor. Lib Dems have been fantastically arrogant in the campaign, claiming everyone else is effectively, mad, bad or dangerous to know. Only they, say the Lib Dems, are clever enough to be in government. Self praise is no praise at all. Polls show the electorate agree. Has Nick Clegg got previous on strategic thinking? In 2010, he led his party into coalition with the Conservatives. He got the Liberals into UK government for the first time in many years, got promises to deliver some of his policies but toasted quite a few others. He tells us (self praise again, Nick!) he stabilised the country and moderated Tory policies. What we can all see is he exceeded any realistic personal ambition by securing the Deputy PM position. 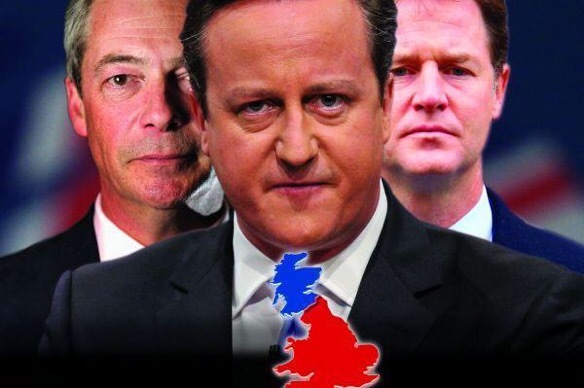 All on the back of 3 good performances in TV debates and a campaign free of serious scrutiny and hitches. Five years later, his popularity and that of his party has plumetted. The Lib Dems have been trussed up like kippers by their coalition colleagues, his ministers saddled with all the bad news in early months of the coalition. He gave up his cast iron promise on Tuition Fees in order to secure a voting system referendum which he and his party were simply unable to win. And the Prime Minister has cleverly played GE2015 TV debates, neutering his Deputy PM while limiting his own exposure. Clegg’s strategic plan effectively rules out his support for any Labour government. How? Well the polls are very tight, and consistent. The parliament will be hung with no single party holding a majority. Nor is there much difference in the vote share and seats between Labour and Conservative, even considering the SNP advance in Scotland. 326 seats required for a majority. Although Tories would have most seats, a Lib Dem coalition delivers only 308 seats. UKIPs 3 seats are neither here nor there in terms of majority and the Tories would look to Northern Ireland for a strong Unionist party performance and their backing. The most credible deal would be between Labour and Lib Dems with SNP support, but Clegg has ruled that out, hasn’t he ? That arrangement would comfortably exceed the majority required for stable government, but Nick Clegg has whipped himself up with the anti-SNP fervour of his (Tory) bosses. A Labour led minority government could still be delivered without the Lib Dems. An arrangement between only Labour and SNP would command 315 seats. Add the 6 seats potentially secured by Plaid and the Greens, you get tantalisingly close with 321. That could be enough for a majority with SDLP support, particularly considering effective majority would be reduced by the seats that Sinn Fein abstain from taking. Come up with different seat numbers, from different polls if you like, but it’s unlikely the deal results above change significantly without a change in voting intentions. Unless Labour can perform better than the Tories in English seats, then they will need support of the SNP and other progressive parties to lock the Tories out of Downing Street. Failure of Miliband to grasp that thistle would be catastrophic. I don’t care much for Malcolm Bruce’s political operandi. I bear him no malice, and note with only moderate distaste that he will likely enjoy his retirement on the comfy red benches of the House of Lords. He’ll be cloaked in ermine and assured in all matters! But what he and his party offer voters in the North East, Highlands and the Northern Isles is little other than bluster, grievance and tactical diversions to cloak the paucity of their own ideas. While Bruce and his protege avoid discussing the fruits of 5 years in government, other than they have cut taxes (in a country cloaked in austerity! ), he has been willing enough to talk up Alex Salmond and the SNP. Bruce is a Unionist. He would also consider himself a grandee of the Liberal Democrats. I’ve seen a few of those, including Robert Maclennan in his latter days as MP in Caithness, Sutherland and ultimately Easter Ross too. I’ve come to realise these men are also Establishmentarians. They and their ilk uphold the British State, without question, and I believe they prioritised that over the representation of their constituents. They have not led, but rather maintained ( the establishment ) during their terms of representation. The Liberals, their origins as the Whigs, are the original partner of the Tories in our two party state. Liberal legacy goes back to the 17th century and were the natural party of government throughout much of the 18th century. They were in with the Limestone blocks. As the successors of the Roundheads, Whigs established Parliaments’ primacy over monarchy and sealed the constitutional monarchy we see now. They were reformers. No longer. The current state of the Liberal party in Scotland, typified by Bruce, is literally petrified. There is little element of reform in the outlook presented to Scots in 2015. They are frozen like deer in headlights, fixated on Westminster and only fit to utter two mantras. mantra 2 (the rural Scotland one) – we’ll defend and protect Scotland from the SNP and any talk of another referendum, ever. Caithnesian – taking a big assumption that Scots wish to be saved from anti-austerity and more power to Scotland. This is a most desperate non-policy, derived from absolute fear of extinction – and not without foundation! Last gasp attempt to gather all non-SNP votes in a pact that offers nothing other than their own survival, careers, privileges and another chance to squeeze into bed with one (any one) of the Westminster parties. As a result of their own actions, the Liberals are open to the charge of not holding to any principle. Which equals the number of original policies they offer. However, the Liberals in Gordon do offer vitriol. In the absence of a vision, La Jardine passionately, with clenched fists, tells you it’s all about Alex and how she’ll stop him. Negative campaigning thinks it’s had a shot in the arm from the referendum – GE15 will tell us if Scotland is still better than that. Eh? Perhaps he means “We’re desperately praying Tories are voting tactically because the polls tell us we’d be glad to get 3rd in Gordon with Angry Jardine blowing my majority”. I couldn’t print any of Christine’s quotes as you may be reading this before 9pm. Their only innovation is to be the establishment party, portraying themselves as the arch Union holders. I used to think the Liberals tried to represent rural Scotland fairly. They’ve lost the plot altogether with a few shots in coalition and they behave and sound like every other Austerity shovelling, welfare grabbing, tax cutting, Trident splurging Westminster party. There’s an Observer article published today, written by a ‘journalist’. ‘Journalists’ are a new job type, which rose in popularity during our IndyRef last year. They are usually journalists from the Westminster village, who unwittingly adopt the apostrophes when they venture across the border to ‘report’ on Scottish ‘politics’. I’m not going to labour (sic) the point. Just refer to the Torygraph from last week and BBC’s Nick Robinson during the referendum. The premise of the ‘article’ was that Christine Jardines liberals have unhatched a cunning plan to unseat (the unsitting) Alex Salmond in Gordon. She has, from his canditure announcement, called for everyone to not vote for Alex Salmond. Selflessly, she has turned over her spot on the voting slip for these protests to be counted. Regrettably, the liberals in Gordon are not unique. Almost every Liberal election leaflet I’ve ever seen has a ‘two horse’ graphic. Divide and be less unpopular than the other guy. What vision! What aspiration! 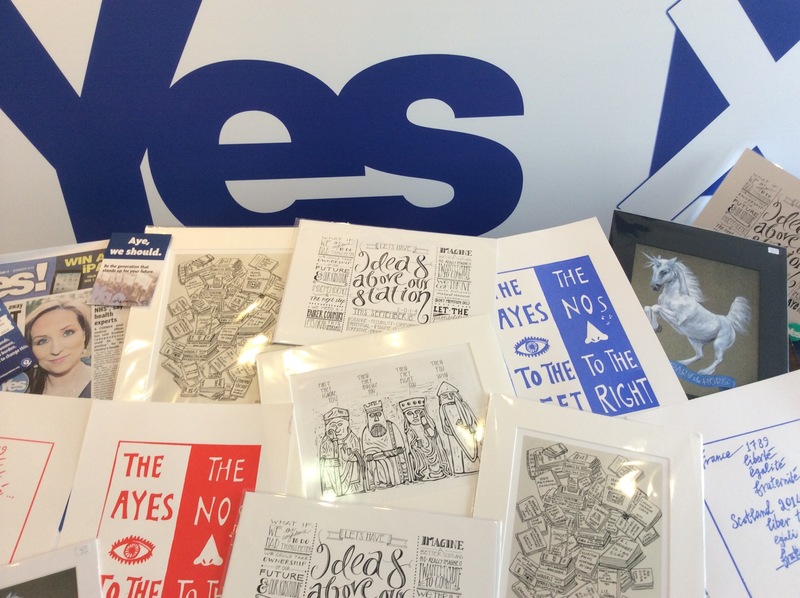 And in 2015, leaflets are landing from the post throughout Scotland, urging The voters not to vote xxxxx (insert either Tory or Labour) because that will let SNP in, and Salmond/Milliband in number 10. The Irony, they hope, is lost on absolutely everybody. Clegg pulled his party to let Cameron and Osbourne into government. So Liberals will tell any ‘journo’ who’ll listen that they are pooling the Unionist vote to beat Salmond. Ms Jardine alone represents the silent majority of Unionist. The article fails to press Ms Jardine on whether she is a Unionist. The article fails on many points, mainly balance. Some Lab or Tory voters may be turning to the LD’s, but at the other side of the account, once liberals are moving over to the SNP because of the liberal leadership sell out to ‘neo-liberalism’, which has nothing to do with the party of Grimmond and Lloyd-George. When policies are challenged, rather than rhetoric, the graphic above shows the Liberals to be rather less popular. LD’s are not espousing a vision, rather an option to be neither Tory or Labour. Pathetic. Tactical voting is exactly that, and a personal decision. Sad that it’s been turned into a campaign form by CJ and others. ‘None of the Above’, or ‘Reopen Nominations’ would be a little more honourable, but CJ and co know that would be ‘suicide’ in 1st-past-the-post system. No longer any honour with the liberals. They are no better that Tory/Lab, just poorer at it. Shame. Professor Alex Kemp, the single most respected commentator on the North Sea Oil and Gas business, says there is oil, and new discoveries, and many uneconomic finds available, which even at current estimates will see the North Sea Oil business beyond 2050. Professor Kemp said that some oil and gas fields, including the Clair field west of Shetland, will last well beyond 2050. He has documented these cases and details behind his comments in a new Aberdeen University report “Illuminating the Future Potential from the North Sea”. The report estimates there will be 271 new commercially viable developments opened up between now and 2050, and acknowledges that there will be a further 58 significant discoveries that he considers would be uneconomic to develop at the current oil price on top of the currently known 125 discoveries which remain parked for the same reason. He said: “New commercially viable developments triggered over the period to 2050 include not only 25 fields currently being assessed for development, but 147 discovered fields not yet at the detailed planning stage, and 99 further discoveries resulting from new exploration over the period to 2045. “The year 2050 is a convenient date at which to stop detailed modelling but the industry will continue beyond that date. “Some existing producing fields such as Clair can confidently be expected to remain viable beyond 2050. “Further, in our comprehensive database no fewer than 125 known existing discoveries remain undeveloped at 2050 because they are not commercially viable at the $90 oil price. He added: “At the year 2050 in our model there are also 58 new discoveries made between 2014 and 2045 which contain well over one billion barrels of oil equivalent but are uneconomic. Prof Kemp also suggested that technological advances could lead to already decommissioned fields being reopened. In the context of looking forward with confidence to the potential for an independent Scotland, Professor Kemp determines the principle that there is lots and lots of oil available to be recovered from our waters in the North Sea and Atlantic. We all understand that oil price can vary, meaning that some fields viability will be affected by the forecast oil price, and also that some finds will become viable in time with the likelihood that oil price will increase over time. The next point to elucidate is that not only does oil price vary, but technology advances – thus making some inaccessible fields accessible and some uneconomic finds viable. Necessity being the mother of invention, engineers and oil firms will constantly reach to recover the inaccessible and the uneconomic. Perhaps that explains why every oil capacity estimate from Westminster since 1970 has been on the low side! Even under the current view, Professor Kemp (a man not given to wild predictions or flights of fancy) is satisfied that he can say the North Sea Oil industry will last beyond 2050. At approximately 15% of our economy, Oil is not the underwriter for Independence, but it is a valuable part of our diverse economy in the early years of a better nation. It gives us the opportunity to right some of the Tory ills and to catch up with our north European neighbours in terms of economy and social provision. It gives us time to develop untapped talent and resources. It gives us industry and jobs in key areas of our country with realistic opportunity of further development on the west coast. It’s that wee bit extra security that we Scots so desire. And it’s damn all good to us if it is squandered on Trident. As the time for Scotland to decide draws near, I think the best way to share my thoughts at this busy time would be through a few shorter posts. This first instalment was posted on a friends Facebook thread after she cried out to her community for advice on how to vote next Thursday as she was torn between both her Scottish pride and Britishness. Among a excellent array of around 90 comments in 4 hours, I chipped in with this. It’s time to take the power of our country and use it’s resources for our people. If we decide that education and health, free at the point of use, is important, then we can deliver that. If we believe a conventional, skilled, well resourced defence force is our priority, vessels ready to patrol our shores but Trident out of the Clyde and off our balance sheet, we will deliver that. The cultural verve and excitement around this referendum matches the groundswell of engagement with the campaigns. Everyone can and is expressing their opinion. YES gives the promise to unleash that energy to build a better nation. This is the most exciting and unique of times. We will never regret grasping this opportunity. All we need to do is finally believe in ourselves.